Exciting design options can sometimes become daunting when you actually begin to place furniture in an open-concept home. Without walls to define spaces, where do you begin? Area rugs are a key organizational tool for designing rooms within large spaces. 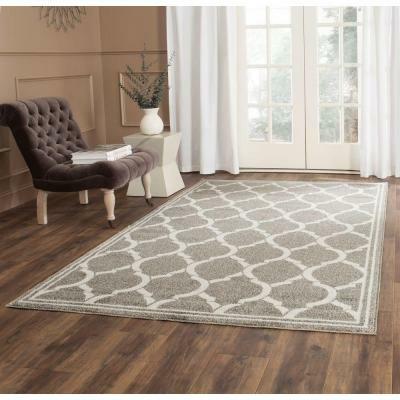 With a beautiful rug, you may outline a foyer where none existed, create a dining room or define a conversation area. Thoughtful placement of an area rug gives identity to a space and creates traffic flow that makes sense. When your front door opens straight into the room without a designated foyer, you can build the illusion of one with an area rug. 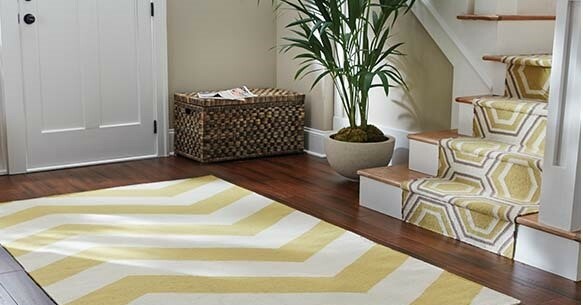 This chevron wool rug is a good example of creating a welcoming entrance and makes a nice contrast to the hardwood. Build on the foyer feel by adding a small piece of furniture and some art. While big rooms and tall spaces are the inviting aspect of an open-concept home, they also bring a challenge for organizing a cozy space for hanging out. 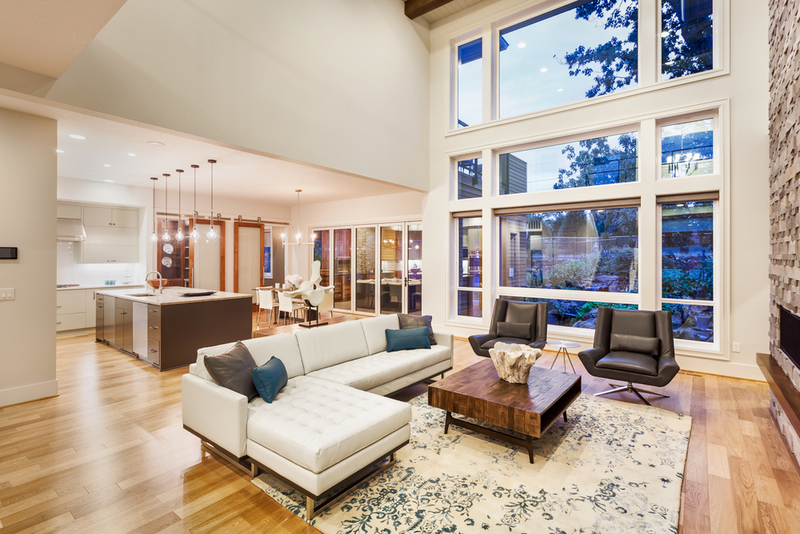 This beautiful living space was undefined until this patterned rug crafted an inviting and cozier conversation area. With high ceilings and big windows, the rug provides an anchor to the room and draws the eye down from the big spaces, making the room feel friendly. Just because your home lacks a traditional dining room doesn’t mean you can’t have one. In this contemporary living space, a large rug creates a dining area. 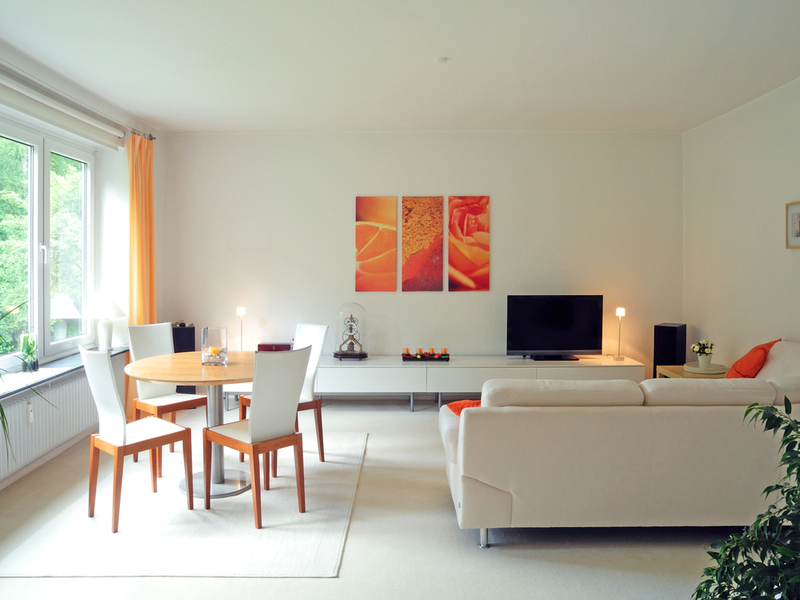 Without walls to create tangible zones, a rug is needed to organize the space into useful areas. When choosing an area rug for under your table and chairs, make sure the rug is large enough for the chairs to scoot back from the table without falling off the edge of the rug. Larger spaces often mean there are multiple entrances and exits to both the outdoors and other rooms. This indoor-outdoor rug not only is visually appealing, but it can handle the traffic from the French doors. More importantly, it creates a traffic pattern. Large patios can also be transformed into defined, open-air living spaces. 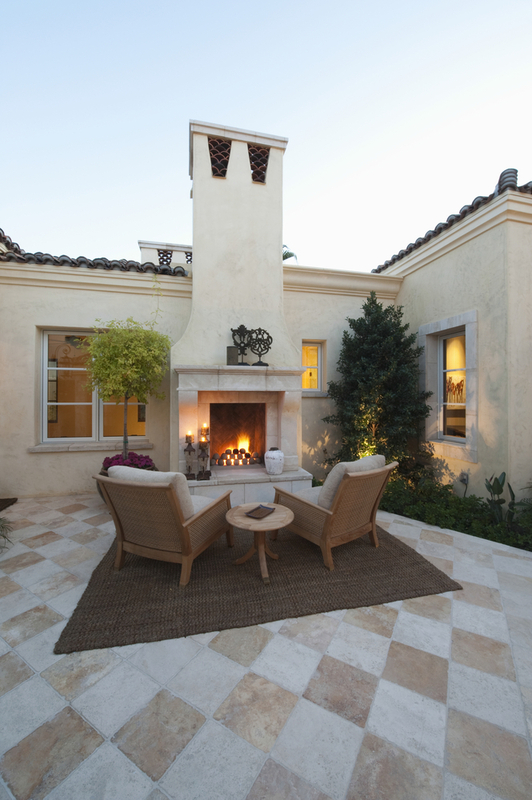 A durable outdoor rug can carve out a great outdoor living room from a space without definite borders. This brown rug centers the seating area in front of a fireplace, creating an inviting, cozy space. With walls coming down in remodels and new homes reflecting open-concept design trends, as a professional organizer, I’ve found that rugs provide comfort and beauty while organizing and maximizing space. 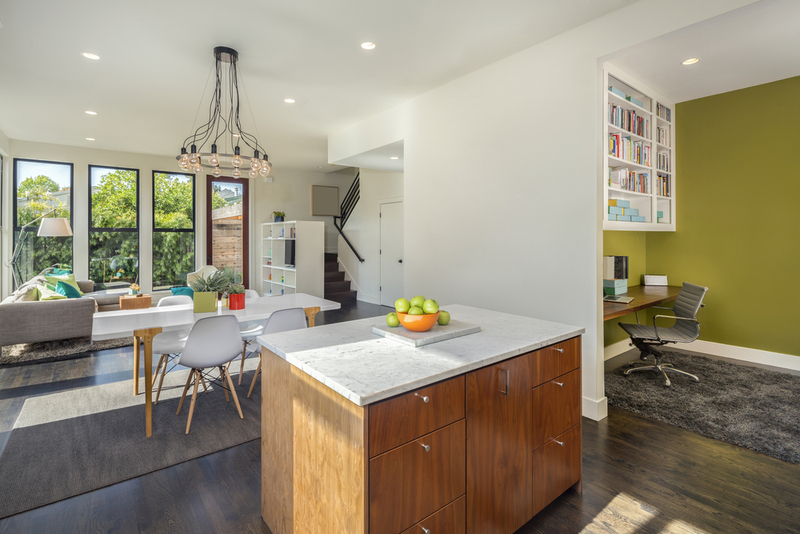 Lea Schneider is a home organization expert who seeks to invigorate home design planning with strong organization techniques. Lea writes for homeowners on these topics for The Home Depot. For an overview of Home Depot's collection of outdoor-indoor rugs, including styles discussed by Lea, you can visit Home Depot's website.